Gone are the days of the conventional storage solutions where physical storage devices used to rule the technology world. Data storage is crucial to every business organization. In this digital era, organizations are wary about safety and security of storing their crucial data in one place. With the advent of technological revolution, businesses have now moved from the traditional storage devices to the more advance and efficient cloud storage solutions. Companies don’t have to worry about losing their critical data any more. Now all your critical business data is safe on the cloud, which is nothing but an off-site storage space managed by a third-party service provider. Cloud has undoubtedly changed the way businesses manage their critical data. The data is stored on cloud-based storage servers which can be accessed through the internet. The companies that provide the network services and infrastructure for the cloud are called cloud service providers (CSPs). Microsoft and Amazon are two of the major cloud service providers in the world. Cloud has revolutionized the whole business ecosystem by providing better customer experience and greater mobile accessibility. Cloud computing is increasing at an unprecedented rate and the way it’s revolutionizing business models it’s showing no signs of slowing down. And Microsoft has been at the center of it for years now. Azure is the public cloud computing platform for Microsoft and one of the major providers of cloud services. Although it entered the cloud war comparatively late than the other players, it has established quite a name for itself as the most popular Infrastructure as a Service (IaaS) and Platform as a Service (PaaS) provider. Azure was officially released in 2010 as “Windows Azure” but was later changed to Microsoft Azure in 2014. It has become a major provider of cloud-based solutions spanning across 36 regions around the world and providing a host of cloud services including those for compute, data storage, web and mobile, networking, media and content delivery network (CDN), Internet of Things, management and security, hybrid integration, and more. Amazon Web Services, or AWS, as the name suggests is an on-demand cloud computing platform for Amazon. AWS has been the leader of the cloud computing market for years and still dominates the public cloud market. It has had the biggest advantage of an early head start in the cloud computing race which still continues to serve businesses and individuals well with its unparalleled offerings. AWS started offering cloud infrastructure solutions like compute and storage before cloud has become accessible for individuals and corporate sectors. The platform was launched in 2002 with only a limited tools and services, and was later publicly reformulated in late 2003. The first AWS service was made available to public in 2004. It provides a mix of Infrastructure as a Service (IaaS), Platform as a Service (PaaS), and Software as a Service (SaaS) offerings. Its popularity is backed by its longing commitment to provide innovative production environments and bring consistent innovations. Microsoft Azure and Amazon Web Services (AWS) are two of the major players in the public cloud computing race. While Azure is the public cloud computing platform for Microsoft which has only been in the race since 2010 but has established itself as a powerhouse of cloud services. 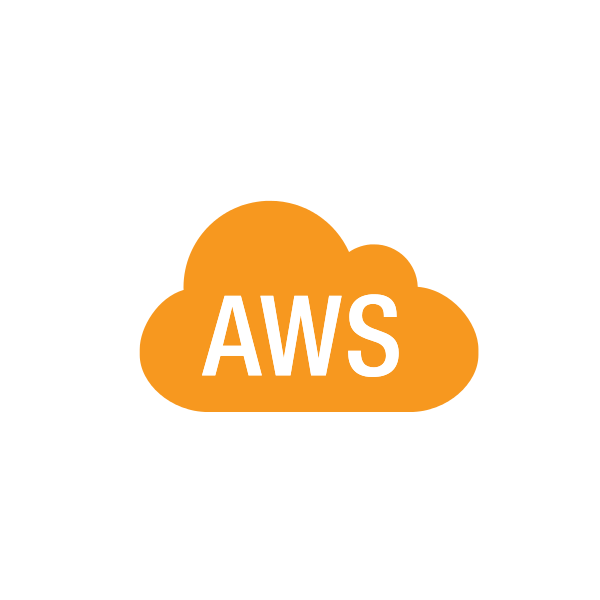 AWS, as the name suggest, is the cloud computing platform for Amazon which has been leading the cloud computing race for more than ten years with its wide range of compelling offerings. AWS categorizes its Infrastructure as a Service offerings into Compute, Storage and Content Delivery Network (CDN), Database, and Networking to help businesses and individuals grow. It offers a wide range of cloud-based products including developer tools, Internet of Things, analytics, security and enterprise applications. Azure offers a wide range of services covering all broad categories including compute, data, app, and networking keeping industry best practices and customized under consideration. It is a mix of both public clouds and private clouds to allow data and applications to be shared between them. It is an integrated cloud service that offers the benefits of multiple deployment models. It simply means to manage a private and public cloud as one. Microsoft Azure has an edge over the AWS in the Hybrid Cloud space. It makes it easier for companies to use their onsite servers on the Azure stack to run their applications. Amazon offers a flexible pricing model allowing you to pay only for what you use. It’s more like utility-style billing meaning you pay for exactly the amount of resources you need. For certain products, you can go for reserved rather than opting for On-Demand model to get significant overall savings. Additionally, you can save more with increased use meaning the more you use, the less you pay. Azure, on the other hand, is a little less flexible when it comes to pricing model. Both Azure and AWS offer similar capabilities in terms of offerings and while moving to cloud itself is a potential gamechanger, it is vital to assess the reliability of both especially when you’re planning to entrust them with your organization’s applications and data. This article compares the two of the biggest names in the cloud computing space – AWS, the undisputed leader of the cloud computing ecosystem against the industries’ favorite Azure. There are clearly a number of compelling reasons to choose either of them as your preferred choice of cloud service provider but at the end of the day, it depends of your business needs and requirements. Sagar Khillar. "Difference Between Azure and AWS." DifferenceBetween.net. 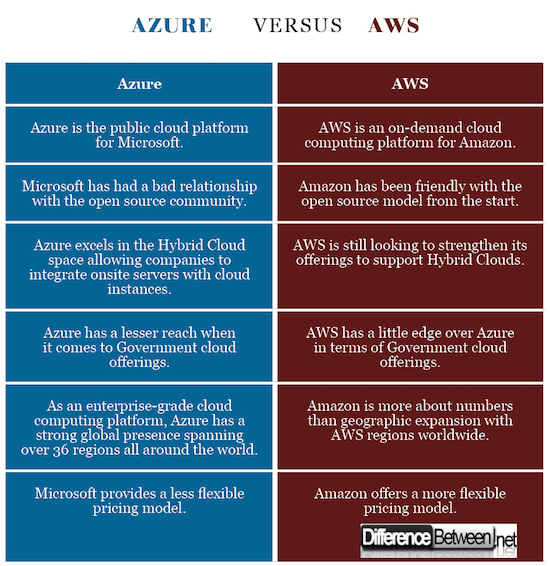 November 13, 2018 < http://www.differencebetween.net/technology/difference-between-azure-and-aws/ >. Your summary of differences is tertiary at best and is misleading and incorrect. The way you present Microsoft on this in comparison to Amazon is misleading. It is true that Amazon has its beginnings of being founded on open-source technology. Microsoft was an original creator of what many have become alternatives to; thus inherently has become known as not open source. “Open Source” itself was carved as one of the “alternatives” to the most commonly used and highly supported Microsoft technologies. Today, Microsoft is more platform-independent and open-source friendly than Google and Apple by a long shot. Microsoft utilizes and bridges all platforms even “open-source”, the same cannot be said of Apple or Google. – Pay direct and get the same price as you would through a Microsoft Enterprise Agreement. – Azure matches AWS pricing for comparable services. – Pay only for the resources you use and cancel anytime.